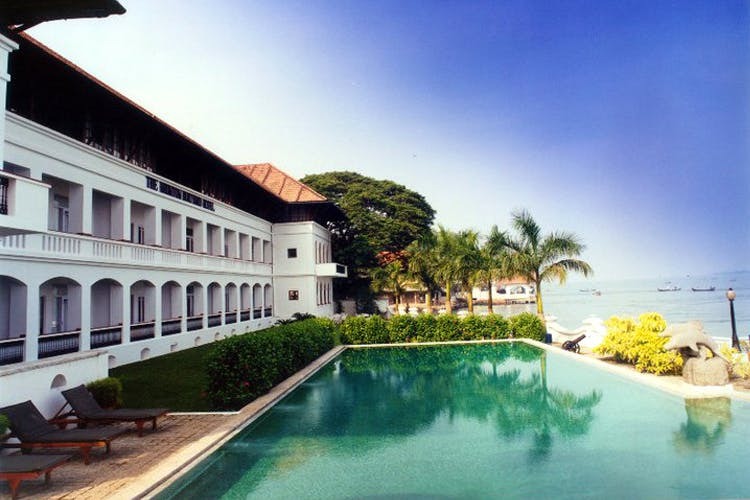 With the picturesque harbour for a backyard and a stately Victorian building to call home, Brunton Boatyard will be one of the things to make you want to go back to Cochin. Fair or not, Kochi/Cochin, is not really a place you’ll keep going back to. No doubt it’ll be the point of entry for the rest of Kerala should you fly in, but otherwise, who’s going to return, right? Wrong! Brunton Boatyard, moored on the most historic strip of the illustrious Kochi harbour, is a slice of history mixed with modern day luxury. And we’ll take the humid air of God’s Own Country as long as we’re living here.A restored Victorian shipbuilding yard, it’s now been transformed into an English meets Portuguese meets Dutch boutique hotel offering standard room and suites — all with a fantastic sea view. Done up to take you back in time, four-poster beds, antique furniture and French windows will keep you in the early 19th Century mood. But in the midst of all this grandeur, our favourite spot is the large bathtub where you can happily soak looking out of the perfectly placed windows into the endless waters. Nothing comes close to sipping on a glass of bubbly, watching the sunset over the sea with dolphins playing in the fore, and ships finding their way home.History, the restaurant, serves authentic Kerala food – which means different dishes from the over 30 communities in the state. You have to eat the Railway Mutton Curry – apparently cooked for six hours so the meat, redolent with spices, just melts in the mouth. Fish Moilee, Vindaloo and cutlets are other must-haves. There’s also a bar and a terrace grill for the fresh catch of the day. They’ll even do demos for in-house guests. If you can manage to get out of the lovely turquoise-bottom swimming pool set in the middle of their equally charming garden courtyard, head to the jetty for a cruise. They have a private craft to ferry you along the harbour to take in the sights and sounds of the port city. If you’re around December-February, make sure you have their Christmas pudding which is Dutch-inspired and with just the right amount of cinnamon. It’s is literally world famous.